Info/ticket center and leaving point. The train ride to the cave’s entrance. 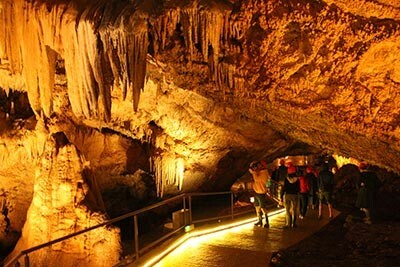 Tour one is the shortest and cheapest one for the visitors that are willing to catch the feeling of being in a cave and witness the beauty of the stalactites, stalagmites, flow-stones and columns. Stalactites are the ones that hangs from the ceilings of caves. These limestone stalactites start with a single drop of laden water leaving a calcite ring. Each subsequent drop that form and falls deposits another ring and after years it forms an icicle. Sometimes this formation goes so slowly it takes 1000 years just for a centimeter. 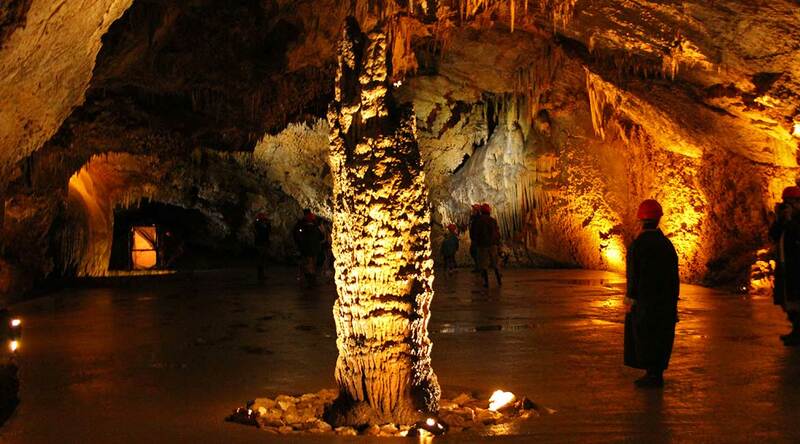 Stalagmite are the other way around and the type of rock formation that rises from the floor of a cave due to the accumulation of material deposited on the floor from ceiling drippings. If stalactites grow long enough to connect with stalagmites on the floor, they form a column. Flow-stones are composed of sheet like deposits of calcite formed where water flows down the walls or along the floors of a cave. Ground plan of the cave. The tour last for approximately 60 minutes and will lead you 400 meters deep into the main tunnel at the cave. All of the descend is made effortless because of the well-made stairs one side of the path and the concrete floor on the other side. The tour is guided by three guides dividing the groups in English and Serbian-Croatian speaking. There are things must be kept in mind while visiting. Like most caves the temperature of the Lipa cave is the average ambient temperature of the climate of the surroundings. For the Lipa cave meaning it averages around 8-12 Celsius all year around. Making it a lot cooler in the cave in summertime when the temperatures easily surpass the 30 degrees mark. So don’t forget to take a sweater or a summer jacket. When forgotten one could still be hired at the ticket office. The second thing there is a no flash photography rule handled in the cave. And at least the most important one is that it’s not allowed to touch the stalagmites and stalactites since the rock build up is formed by minerals precipitating out of water solution onto the existing surface ; skin oils can alter the surface were the mineral water clings or flows, thus affecting the growth of the formation. Oils and dirt from the human contact can also stain the formation and change its color permanently. Descending down past the stalactites and stalagmites. 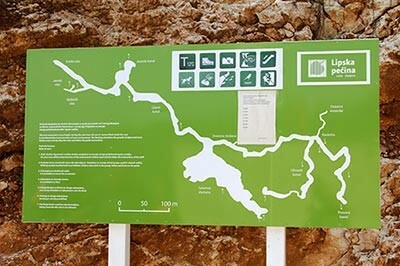 The tour slowly guided descends down being presented with all kind of interesting information by the experienced guides about the cave itself and the Speleology formations. Telling about its discovery, with it’s beauty already being recognized by King Nikola I and Petar II Petrović-Njegoš. The first part of this tour leads along all the better known natural phenomena to end into the main square the “Njegoš Hall” of the cave, were the first tours end but the second tour continues here through a small windy gate. Until here the way down is to easy passable and well lighted making the karstic features stands out very nicely. Except the humidity it’s dry. Probably the guides will take the first tour through the gate to give a small sneak peek of the deeper parts of the cave, to return back to the info center. The second tour takes this visitors into the wilder and adventurous parts of the cave leaving the paved path, were the distributed helmets, flashlights and boots for this tour come in handy. This part of the cave is known for its rich stalactites and the deeper you go, the more beautiful and impressive they become. For this tour some kind of physically activity is needed. Possibilities range from entering the cave in high style by descending from the ceiling on the rope to exploring every single hidden nook and cranny. A professional guide during the whole tour is a must. If you are looking for a unique, richer and deeper experience, take the extreme option and conquer the heart of the cave. Tour can be customized for families with children upon request.